On Monday 22nd February at 13:30 8 people will stand in court in Boulogne-Sur-Mer facing trial for occupying the ‘Spirit of Britain’ ferry on Saturday 23rd of January. Six of the defendants are people without papers from Afghanistan, Sudan and Syria, all currently living in the jungle. They are charged for ‘breaching the transport code’, which in this instance involves entering and occupying a ferry without authorisation. Standing on trial alongside these six will be two French people with papers. They face the same charges for breaching the transport code, as well as a further charge of facilitating entry to the port and ferry. The maximum sentence for these offences is up to 6 months in prison or a €3,500 fine per person. The two people with papers have been released on bail whist awaiting trial. The six without papers were held in detention and have since been sent to Longeunesse prison in Saint-Omer. Regardless of the outcome of the trial, the future for the people without papers is not clear. We do not know if they will be released free or if they will be sent to a detention centre, possibly resulting in them being deported back to the war torn countries that they are fleeing from. This is a call out inviting people to come and show support to those facing trial. We ask for people to come and stand with us in solidarity with those facing oppression and sanctions as a result of resisting the border. We are in the process of organising transport for those without papers in the jungle who wish to be present at the trial, and encourage anyone else who has access to a vehicle to offer the same. The French government wishes to make an example of these 8 people – fight the border and pay the price. We wish to make a stand against this. We will always be against the border. We will always fight for the right to freedom of movement. Come to the court at Place de la Résistance in Boulogne and stand with us, and with our friends facing trial. There have two deaths in the last couple of months, that we have not yet fully acknowledged. 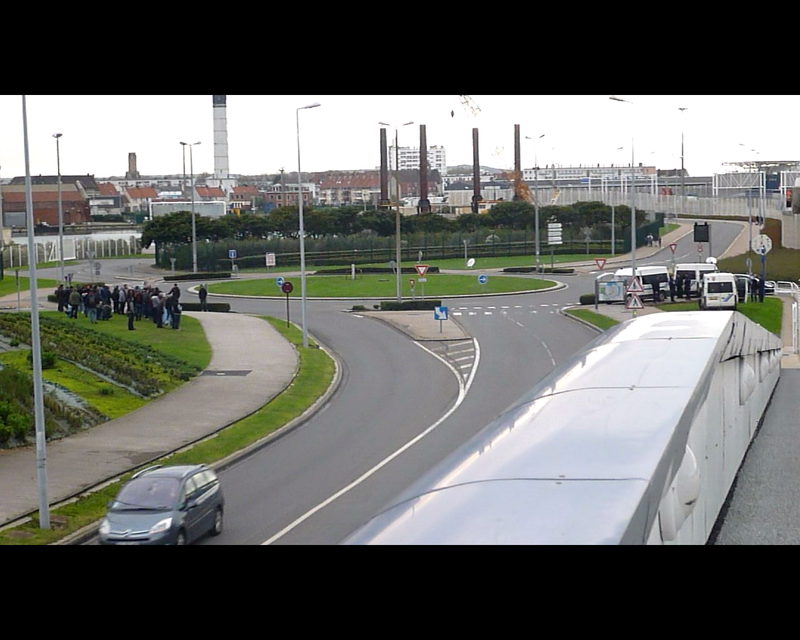 On the 13th of October, the body of a man found drowned in the port in Calais was identified. The body was found on the 20th of September, but it took a long time to identify him. He was a Moroccan man, who was 22 years old, he had been in France since at least 2011, when he was controlled in France. He had gone into the water with someone else on the 16th of September. The other swimmer, another Moroccan man, was rescued and taken to hospital suffering from severe hypothermia. They had been trying to swim to reach a ferry in the Calais port. The second is a 20 year old Eritrean man, who was hit by a train at around 1am on the night of the 30th of September. He was the second person this year to be hit by a train, the third happened yesterday. As usual, the main response by the media and the Eurotunnel, was to just discuss this death in terms of effects on the train timetable and traffic. We mourn for the uncountable loss caused by this border. The fences must fall. Today was the fourth day of our peaceful protest to ask for safe and legal access to the UK to claim asylum. 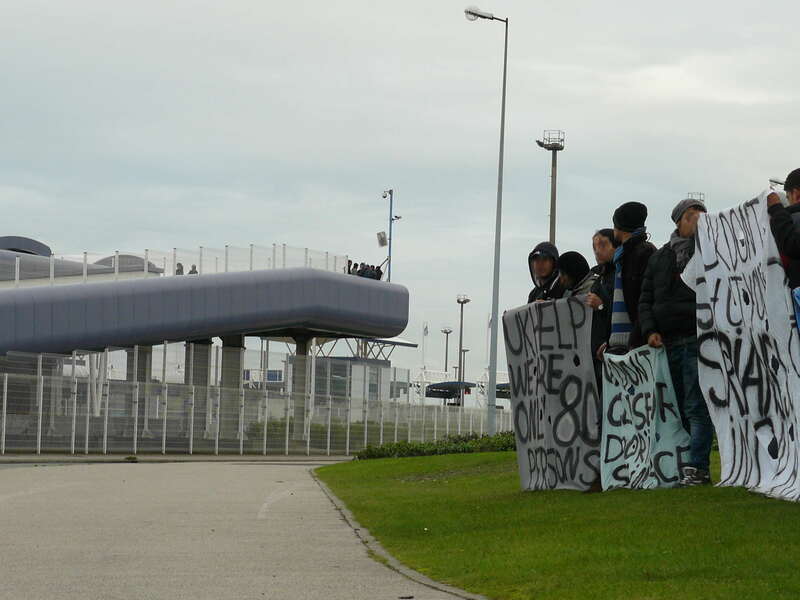 We decided to walk to the port to deliver our letter directly to UK immigration authorities. As we were accompanied by journalists and others with cameras we were given no problems by police on our walk to the port. On arrival we took up position opposite the port whilst 3 of us and some people with cameras tried to enter the port by the footbrigdge. Here we were stopped by security who were soon joined by police, CRS and gendarmerie. Claiming it was private property they refused us entry to the port, saying we had no right of access, and they also refused to allow us to stay on the footbridge. We are very disappointed to not be able to talk with UK authorities in a peaceful and civil manner. We will continue our protest tomorrow and thereafter until the UK government listens to our demands. Join us 2pm at old Salam, Rue Moscou, Calais. Aujourd’hui est le quatrième jour de notre lutte pacifique pour l’accès sûr et légal au Royaume-Uni dans le but de demander l’asile. Nous avons décider de marcher jusqu’au port pour délivrer notre lettre directement aux autorités anglaises. Comme nous étions accompagnés de journalistes, et d’autres personnes avec des caméras, nous n’avons eu affaire à la police lors de notre marche jusqu’au port. En arrivant nous avons pris position en face du port pendant que trois d’entre nous et quelques personnes avec des caméras ont essayé d’entrer dans le port par le pont piéton. De là nous avons été stoppés par la sécurité qui a vite été rejointe par la police, les CRS et la gendarmerie. Sous prétexte que le site soit une propriété privée, ils nous ont refusé l’entrée au port, en disant que nous n’avions aucun droit d’entrer, et ils ont aussi refusé de nous laisser rester sur le pont piéton. Nous sommes très déçus de ne pas avoir la possibilité de parler avec les autorités anglaises de manière pacifique et civile. Nous allons continuer notre lutte demain et les jours suivants, jusqu’à ce que le gouvernement anglais écoute nos demandes.